The company has latest-generation Parametric 2D and 3D CAD software. This allows our technicians to design to the highest standards, producing complex and complete models for any type of vehicle. With the "structural member" and "sheet metal" functions, it is possible to quickly create chassis of any possible section and sheet metal parts with complex bends, calculating their volume, weight and centre of gravity and consequent cost. 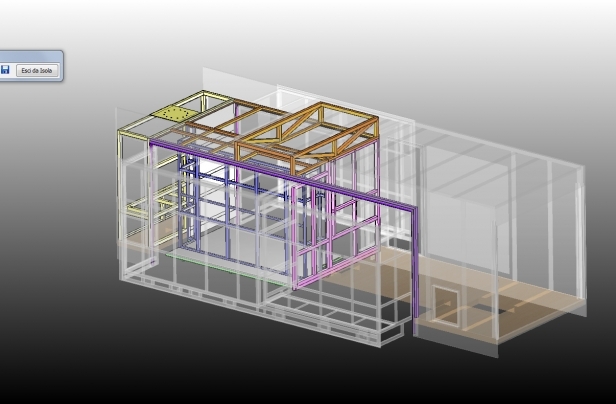 We can provide our customers 3D models so that they can see the design even before it is built! In fact, Adobe’s PDF-3D format allows any computer to display and freely rotate 3D drawings. But we can also provide models in eDrawings format: a powerful 3D viewer, free from Dassault Systemes that allows you to create sections, measure components and add custom notes. In some cases, models can be provided in neutral STP or IGES format, which can then be placed in any 3D CAD environment and manipulated. For 3D views of designs, simply contact our administrative or technical departments..
A brand new CNC machining centre allows us to do 3-axis milling of plastics, composites and wood. 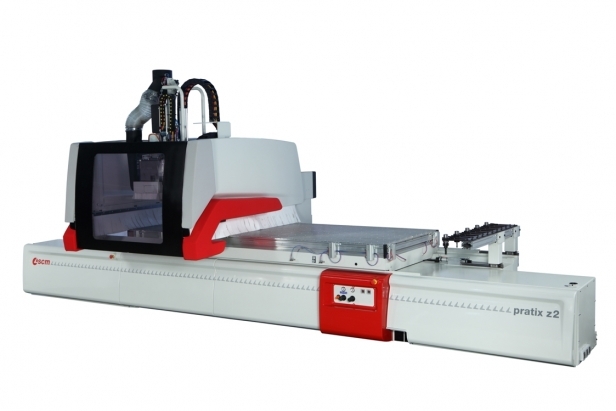 With this machine, we do high-level carpentry, structural work and composite modelling. In particular, 3D milling based on our CAD drawings allows us to create extremely complex surfaces for every type of technical and aesthetic part for our vehicles. In addition, with PhotoCarving technology we are able to mill surfaces based on any photograph or image to create unique artistic effects as well as details that can enrich and customize the most advanced vehicles. Numerical analysis using the Finite Element (FEM-FEA) method Using this technology, we can assess the behaviour of our structures and vehicles from the earliest stages of the design, i.e., even before the product is made! In fact, the finite element method makes it possible to evaluate the strength of materials, deformation and the displacement field of structures of any shape and complexity, with exceptionally accurate results. All this results in designs that emphasize safety and ensure long product life, especially those designed for special uses, such as our OB Vans. 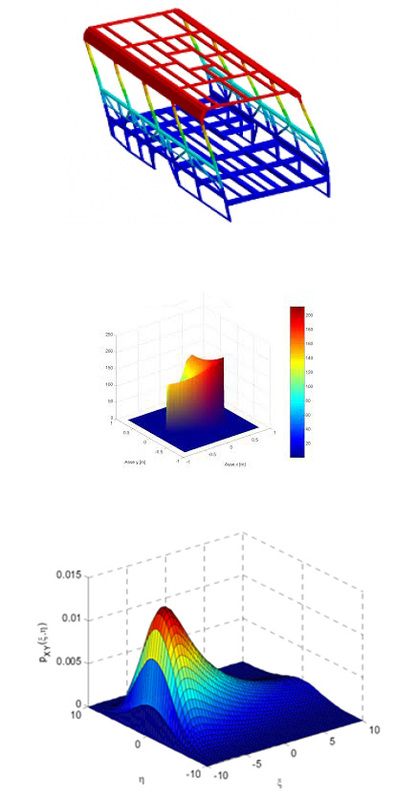 We have finite element analysis software with extremely high capabilities: Linear Static Analysis (LS): this allows us to quickly evaluate the resistance of structures in the linear elastic range. Non-Linear Static (NLS) and instability analysis: when the linear range is not applicable, it is possible to apply geometric (large displacement) and material (curves of customized materials) non-linearity, introducing plastic and viscoplastic behaviours, etc., if necessary. Frequency Analyses: these allow the evaluation of the natural frequencies of the structures (modal analysis) in order to evaluate dynamic behaviour during the operation of the vehicle, as well as to verify that the model is coherently and correctly connected. Moreover, using harmonic analysis, it is possible to evaluate the actual response of a model, starting from the periodic input, impulsive and other types of forces. Impact tests: When static analyses are not sufficient, we can predict the behaviour of models in an impact (crash testing) or fall, using a powerful explicit solver. Fatigue Analysis: developed from the theories of Goodman, the FEM model for fatigue life prediction allows predicting how long a component subjected to a cyclic loading will last. Pressure Vessel Analysis: for checking hydraulic cylinders, but also fuel cylinders and tanks. Thermal Analysis: to display the distribution of heat on surfaces and the effects of temperature on materials and, thus, the strength of structures. Finite Element Classes at our disposal: Truss: In the case of trusses, where it is plausible that tie rods/struts could be subject to just axial load, the simplest and fastest solution is a "truss" element. Beam: A generic beam element, subject to normal stress, shear and moment. This allows fast solutions for all the structures we produce. Shell: 2D elements, suitable for modelling sheet and tubular metal. This allows the optimum solution in terms of the quality/time of the analysis. Brick: The solid 3D element used for analyzing structures of any shape. Examples of the application of FEM in our company: Overturning Analysis: school bus regulations require overturning tests for several types of vehicles. This test is normally destructive but we regularly carry it out with an FEM calculation method that is amply validated by experimental tests filed with the Ministry of Transport. This is an example of how we can evaluate the results even before building the vehicle! Resistance analyses: in general, the structural metalwork produced in-house, such as for vehicle compartments, or the extension systems of our OB Vans, is evaluated using the methods described above to verify tensions, deformations and displacements. If necessary, this analysis is even applied in the construction of the RACKS.  Our renderings make it possible for Tomassini Style to show customers how the vehicle will be before we start production! Rendering is a latest-generation technology that transforms three-dimensional geometries into images and videos with a photorealistic look. That means we can evaluate the shapes, colours, materials and layouts of vehicles well before they are built. Customers can verify that the preliminary design reflects their ideas in terms of both mechanics and aesthetics, but also, we can simulate lighting in spaces with this technology, checking colours and uniformity. 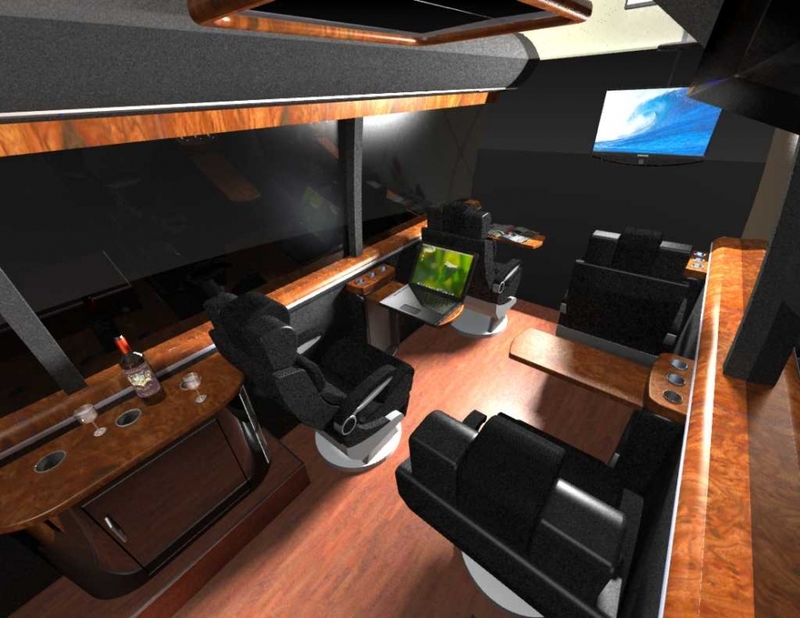 Renderings can be made of any Tomassini product: vehicle interiors and exteriors, construction details and much more.